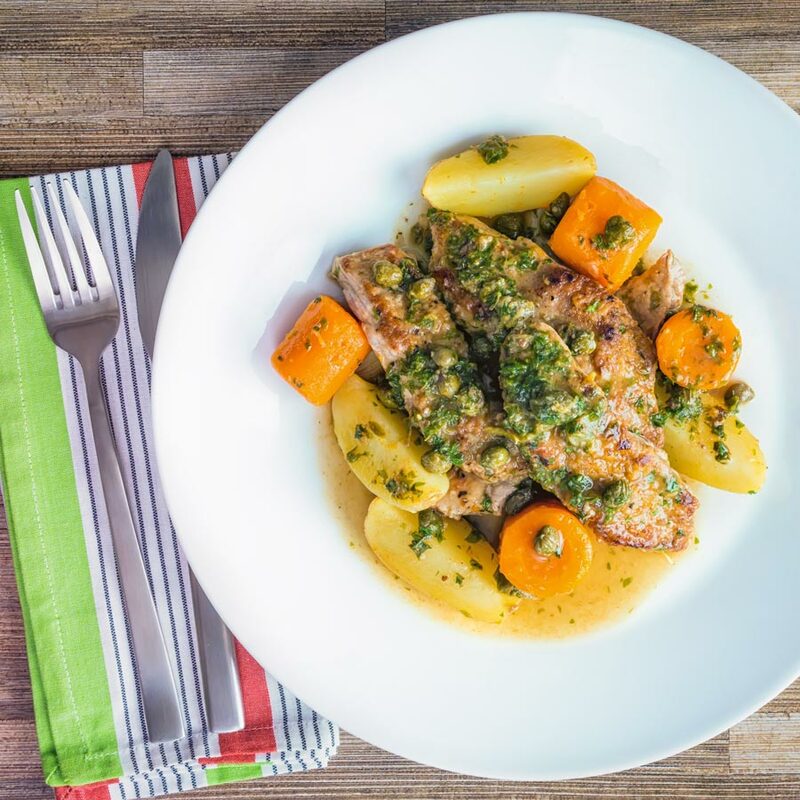 This easy Veal scallopini takes a wonderful piece of veal escalope and combines it with a vibrant wine, caper and lemon sauce to create a delicious simple meal! 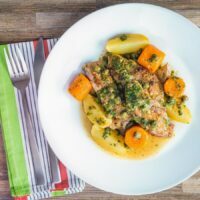 This simple veal scallopini recipe contains some of my favourite flavours to create a complete and pretty quick meal. 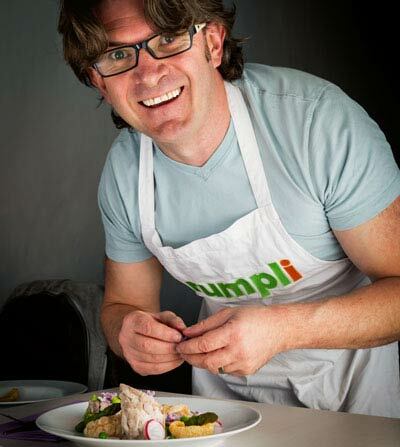 Lemon, capers, butter, lemon and anchovies all crop up regularly here on Krumpli. 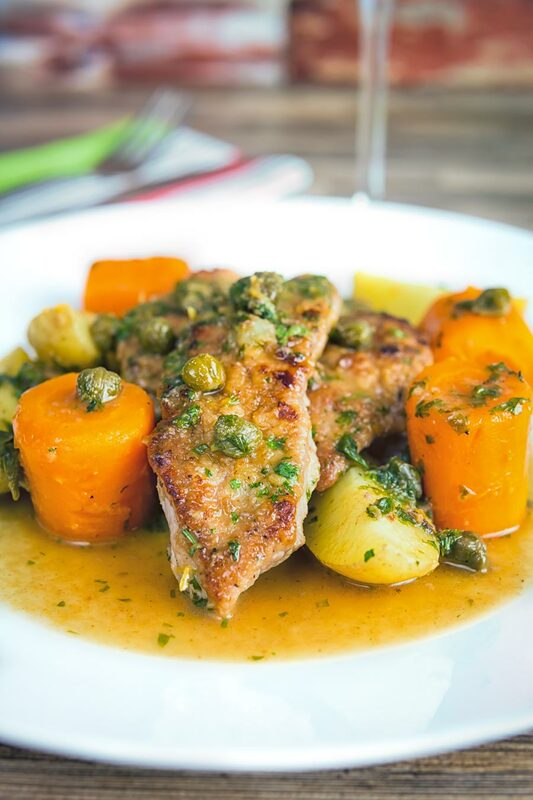 Not least in my chicken piccata recipe which is an American take on the classic Italian Veal Scallopini Piccata. They are flavours that work wonderfully in pasta too as in this creamy lemon chicken pasta recipe. Naturally, this recipe like all of my others is tweaked to my way of eating and preparing food. It is maybe time to fess up, I create complete meals because I am greedy. If you stick a bowl of 3 or 4 sides in front of me I will eat them… Eat them all! Creating complete plated meals allows me to show some degree of restraint when it comes to eating. It is my nod to eating healthily! Quick to prepare and wonderfully simple this is a bright and vibrant dish that is all wrapped in half an hour or so. It is also a wonderful way to get rid of some of that stress. Beating the snot out of a piece of veal escalope to tenderise and flatten it is a great release… Or maybe that is just me? Veal Scallopini refers to the cut of meat used in this veal recipe. It is a thinly sliced escalope from the top portion of the leg. After slicing it is then bashed out flatter to enable it to cook quickly and stay tender. Many people like to use cling film to do this, but I hate cling film. I can not use the stuff it ends up creased and folded up stuck to things that it should not be stuck to. As a result, I prefer to use baking parchment, but use whatever is good for you. After that, it is a simple case of dredging lightly with flour and then pan-frying in oil. Make sure you remove excess flour. You want a scant covering to prevent a slimy covering on your veal which is just nasty. It will also clag up your beautifully vibrant sauce. Where you go from there is down to you. 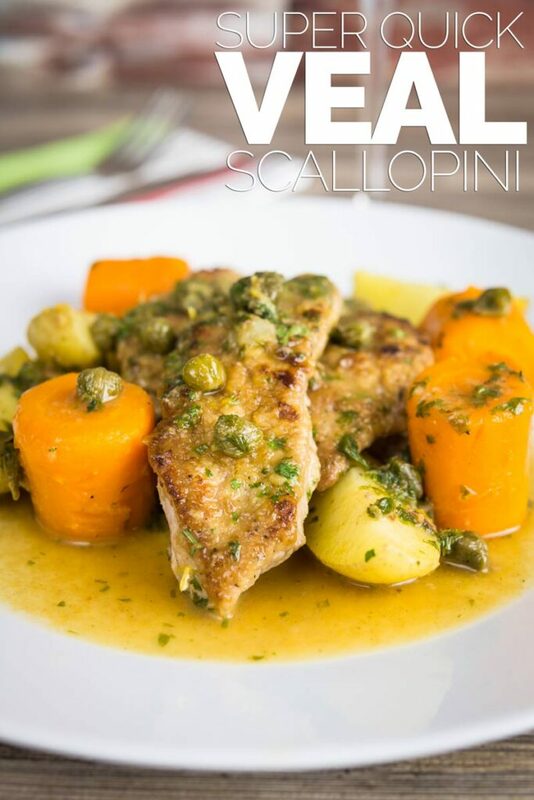 This veal Scallopini recipe is veal scallopini piccata which indicates a caper lemon sauce. Other popular variants include a tomato and wine reduction and the wonderful mushroom variant. 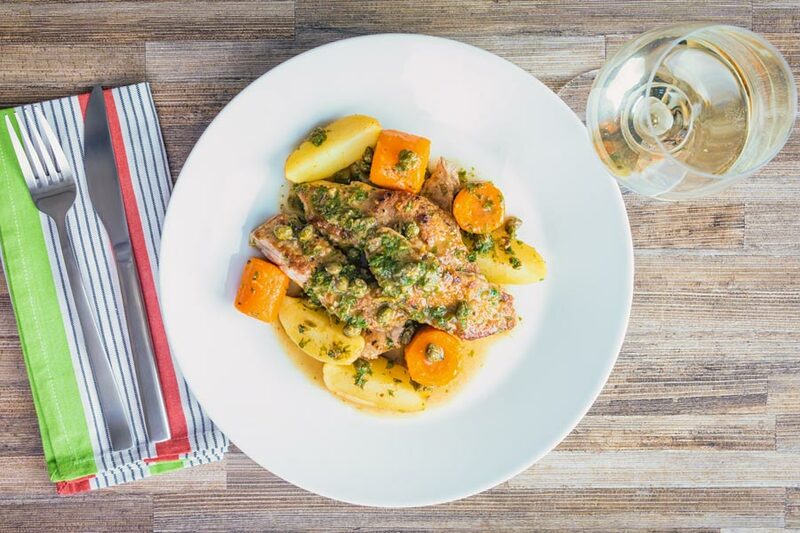 Cooking with veal is often seen as controversial. Indeed there was and still is a practice of terrible animal husbandry when it comes to the production of veal. It was often male dairy cows kept in crates with no movement and fed on milk formula. This produced a white meat that was tender but left a terrible taste in the mouth from an ethical point of view. However, across the EU this practice has been banned for over 10 years and the US is tentatively making these steps according to my research. When buying veal look for something pink in colour and most importantly research what your meat is and where it comes from. Having typed all that the biggest criticism I hear about veal is… “Awww baby cows”. No one seems to care that most veal calves go to market at roughly the same age as lamb or pork. They are also positively old aged compared to your chicken. Anyway, veal is a beautiful treat, a wonderfully subtle, sweet but lean meat that works well with bright and vibrant flavours. It is probably most well known as being the meat used in Weiner Schnitzel but it is surprisingly versatile. You simply must check out my Veal Burger it is quite simply magical! Veal scallopini takes a wonderful piece of veal escalope and combines it with a vibrant wine, caper and lemon sauce to create a delicious simple meal! Bring a pan of water to the boil and season generously with salt. Cut your new potatoes into quarters and your carrots into 25mm lengths and drop into the boiling water. Bash out the veal escalops until they are 5-6mm thick. Heat a large frying pan over a medium-high heat and then add the olive oil. Dredge your veal in seasoned flour. Add in veal making sure that you do not crowd the pan. Cook for 2 minutes and then flip cooking for a further 2 minutes. Remove the veal from the pan and allow to rest whilst we make the sauce. Add in the butter, anchovies, and capers and cook for 30 seconds. Throw in the lemon zest, 1 tablespoon of lemon juice, and wine and stir for 30 seconds scraping the bottom of the pan. Pour in the chicken stock and cook for 5 minutes until reduced by half. Return the veal to the pan and then sprinkle over the parsley, allow to cook for 2-3 minutes. Add in the carrots and potatoes, toss to coat and serve. I am just in love with veal. It’s one of my favorite meats. This recipe sounds just incredible. Loving the simple flavors. It is wonderful and a great way to reduce some of the more horrific practices in the dairy industry. Thank you for explaining what exactly “veal scallopini” are. I spotted them already in Italian restaurants, but was never sure what to expect. Great photos! You are welcome, feel free to order at will, they are lovely! This is such a great way to change up your normal dinner routine. Pefect for a date night in. This looks so delicious. 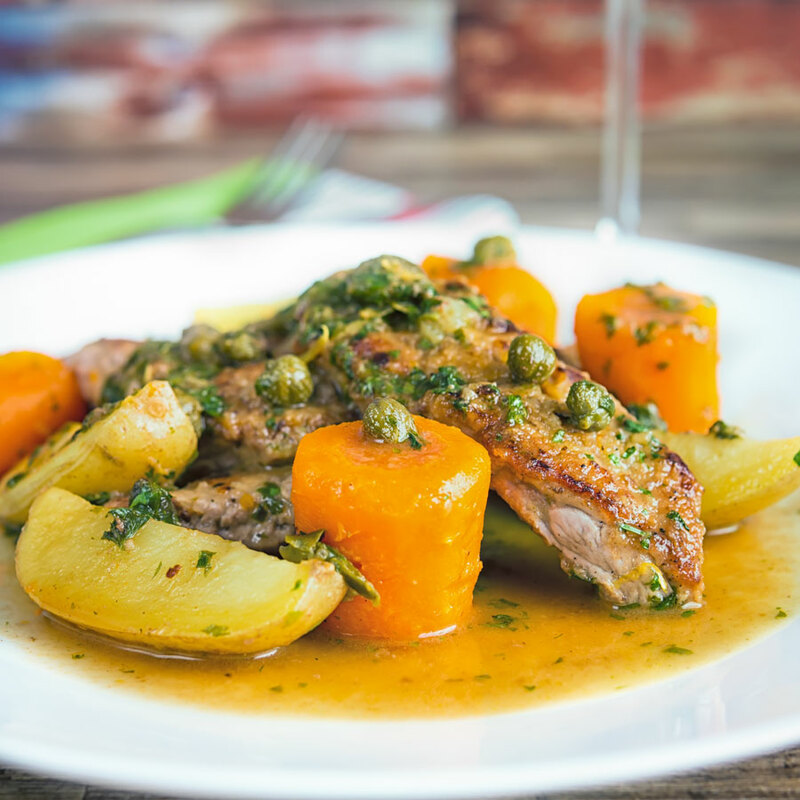 I don’t eat veal very often but definitely need to give this recipe a try The flavours sound incredible! I don’t eat it anywhere near often enough either, but it is a wonderful meat. My husband loves veal, but I have never cooked it. This looks like a really simply place to start. It is a very simple meat to cook and takes very little time you should definitely give it a go.